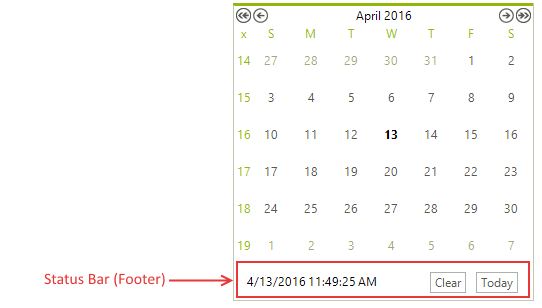 The Footer/Status bar area of RadCalendar is located below the main calendar content area. Figure 1: The footer of RadCalendar. ShowFooter: Gets or sets whether RadCalendar will display its footer/status bar. TodayButton: Gets an instance of RadButtonElement representing the Today button in the footer. RadCalendar1.TodayButton.Text = "Go to Today"
ClearButton - gets an instance of RadButtonElement representing the Clear button in the footer.